If you aren’t familiar with agroecology, this infographic is a great introduction. The UK based Agroecology Group released this infographic called Soil to Sky, created by The Christensen Fund. The graphic follows the impact of industrial agriculture compared to agroecology, on soil, food, water, communities, and the atmosphere. In mid July the African Center for Biodiversity(ABC) published Soil Fertility: Agro-Ecology and Not the Green Revolution for Africa, a comprehensive report on the consequences of the Green Revolution push in Africa, based on it’s fieldwork done in Malawi, Mozambique, Tanzania, Zambia, and Zimbabwe over the last three years.The report asserts that the promotion of increased synthetic fertilizer use in Africa for enhancing soil fertility is a short term fix, and is actually harmful in the long term. Roland Bunch, a researcher and activist for Food First, published a report focused on fact that in Sub-Saharan Africa smallholder farmer’s lands have gotten smaller on average due to population increase and growing amounts of wasteland. This decrease in the size of farms has resulted in the decline of the practice of letting a large portion of such land lie fallow for years at a time, while farmers are able to feed themselves and their families with the rest of it. Without letting their lands have a rest, Bunch says, the soil quality which has held steady for some 3000 years is now declining from overuse. In his report, Green Manure Crops in Africa: A Report from the Field, Bunch detailed his agroecological approach to educating smallholder farmers about the use of green manure, also known as cover crops(GM/CC), which can be grown in tandem with the farmer’s regular crops. Bunch found that the right green manure/cover crop for the specific region can return nutrients to the soil while growing usable foods for local communities. Bunch has been investigating the use of planting crops that can fertilize the soil since the early eighties. Working with an independent group of agronomists from Brazil, he has led an effort to put these methods on the agendas of prominent development agencies. He was also very important to the introduction of the campesino a campesino(farmer to farmer) movement in Central and Southern America; cover crops were a central part of that movement. On April 30, 2016, The African Centre for Biodiversity (ACB) released a report on the the impacts of the Green Revolution on small-scale farming and related socio-ecological contexts. The research is part of a three year multi-country initiative that engages farmers, farmer associations, farmer support organizations, extension workers, scientists, donors, and government officials. Following initial conversations with Zimbabwean civil society organizations (CSOs), the report works to highlight the potential areas for further work with regard to seed policies in the region. production to address the world’s growing demands. 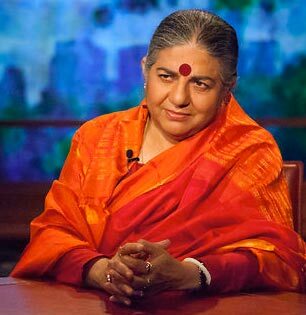 Check out Bill Moyers’ interview with Vandana Shiva as they discuss the consequences of GM seeds on small-scale farmers and the environment, as well as the impact that globalization has had on the food industry so far. Shiva founded a movement to protect native seeds in India, and has been a leader in the global struggle against GMOs. She explains what seed privatization means in India and the rest of the world, and covers the actions of Monsanto, Cargill, and the Gates Foundation.